Humbug is a casual wear label created in the UK to provide a new wave of men’s casual wear that is uniquely styled on bridging the gap between popular British streetwear & traditional themes. Inspired by the everyday wear seen on British streets with added indie-rock influences for an individual style of off-duty staples. Humbug have looked at creating a label of accessible, stylish casual wear, suiting to any informal social occasion, derived from a laid back, on the go lifestyle. The indie-rock influences show in their products through the bold prints of the Rock ‘n’ Rolla and Charleston , and relaxed fits of the ‘901’ & ‘Old Fashioned’ faint gingham shirts, and both sweatshirts, all directly inspired by the band member, gig & festival goer. A relaxed modern style, cool & contemporary, open minded, no borders and a youthful edge is just how we would describe ourselves. I’ve been chatting to Emmett from Humbug and he told me about the brand: “the thinking behind Humbug was to produce high quality, stylish, cool clothing for those who were perhaps paying too much for rent in trendy areas, or living a city life – eating out, partying at trendy bars whilst also trying to keep up style wise, much like ourselves and everyone else we know coming out of uni. “Looking at being that bridge between popular street wear & traditional themes, offering contemporary casual wear that is relaxed and designed for the everyday but also takes that craftsmanship from the likes of many of the Scandinavian brand which are so prominent in the menswear market at this minute. This faint blue gingham check shirt gets it name from the cocktail ‘the 901 blue’ made using 901 silver tequila. The rich blue colour in the drink comes from the blue curacao, a liqueur flavoured with the dried peel of the laraha citrus fruit, grown on the island of Curaçao. This shirt is brushed to add softness and a textured finish to the exterior of the fabric. Finished with a faint gingham pattern by pairing two close shades of a light blue, creating an illusion from a distance of a solid coloured shirt. The trim but comfortable fit allows for a relaxed look making it the ideal casual shirt which can be worn to fit, or over sized. At its best with a pair of dark jeans & boots. Your everyday get up. Navy sweatshirt with logo patch label detailing. One of those must have items. 100% Sueded Cotton. From its athletic roots the sweatshirt has become one of the most popular items in the wardrobe. Its casual styling has made it the ultimate everyday item for any social occasion. 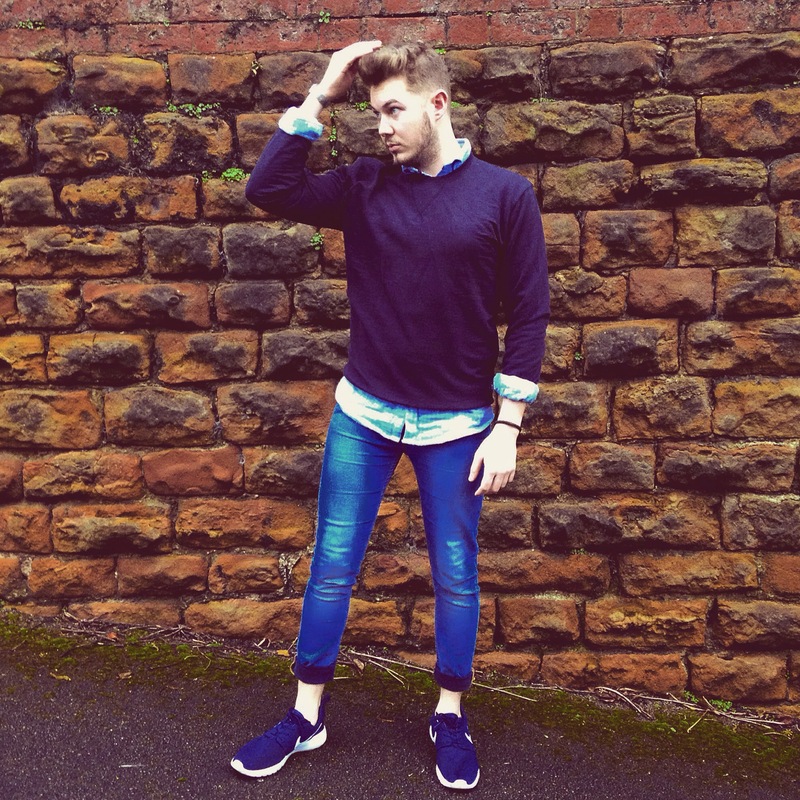 …Twinned with some Asos skinny jeans and Nike Roches, you’ll be onto a winner! Take a look at Humbug for some great items. Style it! What You Wearing?